In Australia, we have many water storage dams but probably still not enough. These dams, apart from their obvious irrigation and water supply uses have quite significant recreational value. And probably the most significant is rural amateur fishing. However they may also have a high potential for Storage Dam Aquaculture. These large impoundments are stocked with native species that either have a local significance in terms of occurring naturally in local rivers and streams or are exotic sport fish such as salmonids. Some examples include rainbow trout in the colder rivers of the south, various native temperate species, such as the Australian Bass, Silver Perch and Golden Perch and the excellent sport and eating, Barramundi in the tropical north. World-wide aquaculture is an enormous growth industry and the potential for storage dam aquaculture in Australia is only just emerging. These sport-species are all hatchery bred and stocked as fingerlings in large quantities. The stocking rates vary considerably relative to individual species, and are based on previous stocking rate information and predetermined species survival percentage/predation estimations (Bennett 1962). These estimations included assessment of size, age and productivity of the individual impoundment. The significance of this point for aquaculture is, the existence of credible infrastructure, supply and researched production estimates. Recreational fish stocking is typical of developed countries, including the United States and many parts of Europe as shown in Table 1 (Welcomme 1996). However in many of these countries there is an emerging trend toward utilisation of impoundments for aquaculture. In Australia, inland cage culture is being trialed for species such as Silver Perch, Rainbow Trout, Murray Cod and Barramundi but so far has only been described as novel at its current stage of development (Gooley et. al. 2000). To date there are no commercial activities in NSW utilising storage dam aquaculture (pers. com. Ian Lyall NSW Fisheries). Pillay (1990) discusses the potential for aquaculture from the flooding of new impoundments and the significant growth from fish stocks assisted, in many instances, by the decay of vegetation in new dams. The decay creates a higher trophic state, which increases productivity and biodynamics and as such sustains considerable numbers of fish (biomass). It is known that over time this high pond productivity is reduced and the productive biomass tends to reduce also. New impoundments undergo ‘ecological birthing’ and high juvenile states of productivity dynamics where species interaction is initially unstable. However substantial crops have been achieved from stock and recapture with monoculture and polyculture using species that occupy different niches or zones within the water column. These significant pond and biodynamic factors of large reservoirs are what gives them a high potential for commercial storage dam aquaculture. As Table 1 indicates the model is quite different for developing countries but the use of impoundments for fish stocking and fisheries development of both native and exotic species is becoming a world wide phenomenon which appears to be gaining momentum fueled by the positive results and publications coming from mainland China (De Silva 1991). China has approximately 20 million km2 of potential fresh water aquaculture area (Liao 1990). And it has significantly increased aquaculture production in recent times. This is the direct result of the internal demand for domestic protein which, has led to considerable development in impoundment aquaculture methods accompanied by considerable and remarkable increases in output (Pillay 1994). The success of China’s large-scale results has positive follow-on potential for application in both developing and developed countries. China is an interesting example within itself. China, in many respects, is both developed and developing with an economic surplus every 3 months of 7 billion dollars AUD$ in 1996. As well China is very active in developing both native and exotic species for aquaculture to service its huge domestic demand. Of the total world inland aquaculture, Asia produces 90% and China approximately 60% of that (Mace 1996). Chinese and Indian Cyprinids or carp species (Welcomme 1996) make up 47% of that total. Reservoir/storage dams are constructed primarily for irrigation, hydroelectric power and/or flood protection in China and reservoir fisheries appear to be a viable secondary culture system. These fisheries operate as ‘stock and recapture’, ‘natural recruitment and capture’ and a small degree of ‘cage culture’ with the first two operating in varying degrees of polyculture. They now appear to be well managed with individual hatcheries and are highly productivity (De Silva 1991). In China the establishment and usage of reservoirs as fisheries has increased considerably since 1949. China now produces 32.3% of the world’s inland fish production. The total area fished is 1,441,513 hectares, which has increased 13.8% since 1980 (De Silva 1991). Reservoir fisheries have become well established and have the experience of trial and error methodology dating back to 1949. China’s reservoir fishery is mainly stock and recapture systems, although natural recruitment is a feature in larger reservoirs from self-reproducing species. Cage culture appears, at present, to have little significance with inland storage dams but is being trialed in Hubei Province (pers. com. Wang Jiaxi, Fisheries Institute Wuhan City Hubei Prov.). Cage culture was utilised considerably in Sichuan Province and reached a production of 16,412 tonnes in 1998. However with cages covering 3% of reservoirs, rapid eutrohpication was created causing massive mortality and this factor has restricted further development (Wu 2000). Demand for seafood throughout the world is increasing while landings from capture fisheries are static. In Australia, the growing seafood consumption is being increasingly met by importation (imports of fisheries products have increased by 52%, over the period 19919/92 to 2001/02; ABARE 2002). In Australia, the value of aquaculture production has trebled since 1991/92 representing an annual growth of 14% in nominal terms and 11% in real terms. However, expansion of coastal aquaculture is limited by a shortage of suitable sites with the necessary water quality, depth and proximity to land-based infrastructure that are not either being used or considered for urban and tourist related development or judged to be of too high environmental value for aquaculture. Investigating the potential of inland saline aquaculture is now a specific priority for NSW Fisheries. Gooley (2000) supports the potential for development of storage dam aquaculture and cage aquaculture as 1, “integrated culture with existing agriculture” and 2 “as a way to utilise inland saline groundwater”. Inland trials have now also commenced in WA, Qld, and Victoria. Click on Sustainable Mine Lakes to view developments in WA. Inland saline aquaculture and storage dam aquaculture may offer partial solutions to the current shortage of coastal sites for aquaculture. Incorporating aquaculture into saline groundwater interception and evaporation schemes may provide an economic return to the costly business of building and operating these schemes. Preliminary research has indicated that, provided potassium is added to saline groundwater it is suitable for farming marine fish. In order to generate enough accurate data to allow the economics of inland saline aquaculture to be evaluated, the Inland Saline Aquaculture Research Centre (ISARC) at Wakool-NSW has now been constructed. The ISARC at Wakool is the only research Centre mainly focused on proving the commercial validity of inland saline aquaculture. 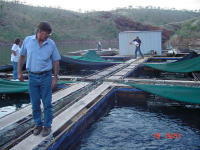 However implementation of freshwater impoundment aquaculture programs in NSW, based on impound fisheries techniques, could only be achieved by cage culture if public storage dams were utilised. The open system of stock and recapture would not be viable in Australian impoundments as these are public property and allow unrestricted access for recreational fishing and other activities. Any application for such usage would cause considerable concern from existing users. Currently, one medium sized barramundi farm exists on the lake. This consists of a hatchery located at the tourist village and grow-out cages moored in Bamboo Cove, near the boat ramp. This farm produces about 50 tonnes of 2-3 kg barramundi per year, sent to markets in Perth, Sydney, Melbourne and occasionally overseas. The operators of the farm plan a considerable increase in production over the next few years. It provides employment to 2 full time and 3 seasonal staff. Jim Hughes from Ord River District Co-op looking at Barramundi and Silver Cobbler at Lake Argyle at Feeding time. After an extensive environmental impact assessment Fisheries WA believes that up to 2,000 tonnes of barramundi (or a similar finfish) could be produced in the lake annually. In February 2000, expressions of interest, to develop a large-scale industry on the lake, were called for in conjunction with a global marketing campaign. Lake Argyle also supports a small commercial catfish fishery, marketed as "silver cobbler", which produces about 120 tones/year valued at around $300,000, and employs around eight people directly. Several small scale operators have established "fish-ponds" around the town of Kununurra. They are pioneers who are integrating aquaculture into the irrigation area, and trying to gain the benefits of combining the two production systems such as diversified production, dual use of water, and generating off-season employment and income. A range of freshwater species are currently being evaluated including sooty grunter (a local bream), barramundi, redclaw crayfish and various ornamental species. The above storage dam example of Lake Argyle highlights a significant potential for commercial return. 50 tonne at $10 per kg is a gross of $500,000 between 2 full time staff and the lake has a potential for 2000 tonnes. Perhaps cage culture would have significant advantages for use in large private storage reservoirs as well? For example; the extensive coal mining in the Hunter Valley area of NSW has created vast water storage ponds with considerable depth up to 40 meters. Some of these 'strip-mine lakes' have remained freshwater and some have varying levels of salinity. Mining companies are always looking for good environmental publicity so a workable plan could create a viable partnership for commercial investigation. These storage dams or strip-mine lakes (Bennett 1962) have chemical and pH problems, which, potentially, can be neutralised by the application of considerably quantities of agricultural lime. This type of private impoundment aquaculture would allow stock and recapture fisheries of considerable tonnage or cage farm applications like Lake Argyle while providing a degree of security. Suitable species would include all the commercially available native species currently being farmed in Eastern Australia. A stock and recapture fishery would be ideally suited to species like the Golden Perch due to its consistent market price and proven success in large impoundments. As well, it does not readily breed in impoundments without floodwaters (Lake 1969) offering a degree of control over stock. Silver Perch would also be well suited as they can grow to 4-5kg within a few years (personal observation of broodstock collection in Chaffy Dam NSW) but, unfortunately can develop a rather offish flesh with marbling and layering of an off-flavour gristly fat as they age. In contrast, golden perch appear marketable up to any size. A potential development of a Golden Perch “Supply & Capture” Fishery could be made possible if commercial access to one or several of these mining strip-mine lakes were provided. And the Lower Hunter Valley has a climate ideally suited for culture of this species. There are many mining sites in this area with power, access and suitable adjoining land for the establishment of hatchery facilities. All the operational facilities could be developed in close proximity to the impoundment and be totally run on-site. As there is no existing protocol for such a venture one would have to examine the concept on a pilot scale to evaluate the unforeseen factors of construction and operation. In preparation for such discussions a trip to Lake Argyle in the Kimberly Region could be beneficial to discuss the problems encountered in development of the barramundi cage farming project. Potentially, many costly unforeseen problems could arise during the development stages that may have already been dealt with. Further commercial research may be available from the various Provinces in China. In the past I have sort advice and information from associates in Wuhan City Hubei Province, China and they have extensive experience with storage dam aquaculture. The mining companies would need to be contacted and arrangements made to discuss a preliminary proposal outlining the concept. Further discussions would then ensue if there were elements of mutual benefit. Sites could be investigated and assessed for site potential and water quality. Further discussions would then outline a suitable plan and if a potentially viable and mutually beneficial concept could be agreed upon discussions would then proceed with NSW Fisheries to gain formal approval under the act. Sub-leasing of impoundments may violate the mining lease conditions and there may be numerous such legal problems, political hurdles and environmental assessments prior to discussions with NSW Fisheries regarding appropriate permits and regulations. However NSW Fisheries have an existing “Policy Platform” with substantial provisions providing for the development of one or more strip-mine type storage dams or private impoundments either on the western or eastern drainage or both. These factors are included in the issuing of NSW Fisheries Aquaculture Permits, Class E (multi impoundment) or Class C.
An alternate approach would be to negotiate with private landowners who have significant storage dams to discuss stock and recapture fishery or cage culture venture. Indeed this is probably already happening to various degrees of culture and legality. However many private impoundments are seriously affected by drought conditions. The potential for drought to be a considerably damaging factor is worthy of serious consideration when assessing the site potential for any type of aquaculture venture, particularly in Australia. Further foreseeable problems would be encountered from the pioneering nature of such a setup. With no existing protocol of experience, mistakes will almost certainly occur. For example, water quality stability and experience with impoundment dynamics and biodynamics (sustaining a commercial ecosystem through addition of nutrients to increase the trophic nature of the impound). As well as commercial harvesting methods, potential aeration requirements, protocol designs, the economics of sustainable marketing and prevention of price collapse from over-supply. Assuming the project has reached an agreement stage and sufficient funding has been found for an initial start-up, it would be difficult to provide a pilot operation that held any valid result for a capture fishery. If a smaller dam were to be used the stocking and harvest may not reflect the potential of the substantially larger volume due to the availability of feed and significantly increased depth and other factors that size and volume create. However sufficient research would need to be carried to give some valid indication of the proposed stocking density and potential CSC and carrying capacity. One would start by tracking down existing reservoir stocking rates and extrapolating as much from the data as possible combined with information on Asian and Chinese methods, species and results. Financially, the development process would most likely proceed as a low cost start-up phase with a considerable breeding, stocking rate and addition of fertiliser regime to generate pond dynamics and productivity. a) pH control as strip-mine lakes would tend to be low in alkalinity, hardness and pH (Boyd 1982). b) Assessment of turbidity and whether upwelling and aeration would be beneficial to reduce thermoclines and stabilise water column temperature. c) Reduction of turbidity by increasing organic and nutrient loading to improve natural productivity. 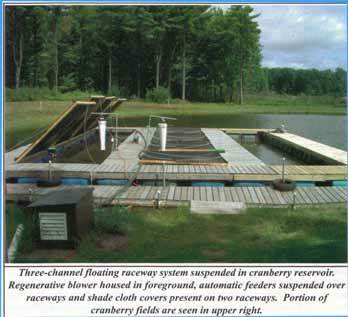 d) Stabilisation of runoff into the impoundment, to reduce further turbidity which then stabilises sunlight penetration and increases natural productivity. 2) Introduction of artificial reef systems by the introduction of inert car tyres strung together in various shapes as well as the sinking of timber structures to cover large areas around the perimeter. It is anticipated that these structures may aid in increasing the standing capacity of ‘icthyomass’ (De Silva 1988) and greatly assist in reducing the bird predation problem to manageable percentages (Barlow 1994). 3) Harvesting would probably be most efficient using mesh netting and could designed to provide between 1-4 tonnes per week at approximately $10/kg. A 125mm gill net will catch only 500g and higher fish only, in accordance with current market demand requirements. Fish can also be caught live in drum type nets (fyke nets) and transported to Sydney for sale into the live trade. The current live trade could currently handle approximately 500kgs to 1000kgs per week at about $22/kg wholesale. 4) A stocking rate of 200,000 x 50 mm fingerlings, produced on site, should generate a maximum biomass of 60 –70 tonnes production in a strip mine lake covering 47 hectare x 50 m deep. This equates to a stocking density of 4255 fish per hectare or 1 fish per 117.5 m2. Financially these figures equate to a maximum gross turnover of $700,000 per the first 24 months if sold dead on ice on current prices. (pers. com. Sydney Fish Markets). 5) Hatchery requirements ( farm protocol development) could include 4 x 25m x 25 m integrated hatchery/nursery ponds with direct plumbing to the reservoir. As well as, power and associated pumps and tanks for spawning and larval rearing. After hatching and maintain larvae until day 5 they could be flush-released into the nursery ponds. The nursery ponds would be previously prepared and fertilised and enhanced with the cultivation of live feed and added aeration. Nursery Golden Perch should reach 50mm in 2-3 weeks at 24 degrees C. at which time they would be easily drained directly into the reservoir past an optical fish counter mounted in the final section of piping (We design and manufacture Hatchery Output Counters at Aquaculture Solutions Australia). Such a system allows for hatchery batch culture which will vary as a function of biomass performance and harvest. Broodstock would be selected for history and performance and maintained on site as well as back-up stocks in nearby selected ponds. Feeder fish species and yabbies would be run through the hatchery and on-grown in the nursery ponds in batch culture systems. 6) Basic restocking would commence in approximately 12 months and or based on growth rate assessment and projections for sustaining a standing biomass as well as CSC (critical standing crop) (Barlow 1986) and biomass performance. These are start up factors as no commercial carrying capacity is known. The hatchery could be operated throughout the year to supply supplemental feed fish and or carry on other commercial activities if required. These other activities, eg goldfish, could be on-grown in floating cage systems or simply on sold. 7) Managed mixtures of both organic and inorganic fertilisers would be applied to enhance natural productivity. Fresh cow manures and floating phosphate ‘delivery bags’ would initially be used as well as periodic applications of urea relative to algal blooms. At the proposed stocking rate the organic fertiliser application would be approximately 200kg per day. Agricultural limestone would be added to increase total hardness to approximately 20ppm (Boyd 1982). And pH would be managed at slightly above 7 as this figure appears to be significant for golden perch growth (pers. observation of farm dam results). Pond Dynamics would be the major tool for managing productivity. In conclusion, De Silva (1991) discusses the mean annual production of similar reservoir fisheries in China at 6750kg/ha/year. In the above model for Golden Perch the expected start-up production is 60 tonnes per 47ha per 2 years, which equates to 638kg/ha/year. At 10% of the Chinese example there would indeed appear to be substantial commercial potential to warrant further investigation into the commercial fishery utilisation of storage dam aquaculture in NSW. Barlow, C. G. 1994. ‘Bird Predation of Silver Perch in Ponds’. in Silver Perch Culture: Proceeding of silver perch aquaculture workshops, Grafton & Narrandera April 1994. ed S. Roland, Austasia Aquaculture Pub. Bennett, G. W. 1962. ‘Management of Artificial Lakes and Ponds’. Reinhold Publishing, New York. De Silva, S. S., Zhitang, Y. & Lin-Hu, X. 1991. ‘A brief review of the status and practices of the reservoir fishery in mainland China’. Aquaculture and Ficheries Management, vol. 22. pp. 73-84. De Silva, S. S. 1988. ‘Reservoir bed preparation in relation to fisheries development: An evaluation’, Reservoir Fishery Management Workshop Held in Kathmandu, Nepal, 23-28 Nov. 1987, International Development Research Centre, Ottawa, pp.121-30. Gooley,G. J., S. S. De Silva, P. W. Horne, L. J. McKinnon and B. A. Ingram 2000. ‘Cage Culture in Australia: A developed country perspective with reference to integrated aquaculture development within inland waters’. Cage Aquaculture in Asia: Proceedings of the First International Symposium on Cage Aquaculture in Asia. pp. 21-37. Asian Fisheries Society, Manila. Lake, J. S. 1969. ‘Freshwater fish of the Murray-Darling River System: The Native and Introduced Fish Species’. NSW Fisheries Publication No 7. Loai, I. Chiu. 1990. ‘Aquaculture in Asia: Status, Constraints, Strategies and Prospects’. TFRI Conference Proceedings of the 1990 APO Symposium on Aquaculture. Pathak, S. C. 2000. ‘Status of Cage Aquaculture in India’. Proceedings of the First International Symposium on Cage Aquaculture in Asia. pp. 21-37. Asian Fisheries Society, Manila. Wu, Z., Gou, J. Yang, Y., ‘Current status of sustainability of cage culture in reservoirs: A case study in China’. Proceedings of the First International Symposium on Cage Aquaculture in Asia. pp. 21-37. Asian Fisheries Society, Manila.